Now you can have sushi for every meal! Don't worry, for those who have an aversion to fish, this sushi is made with fruit, cereal, and a tortilla. Perfect for kids and adults alike, it's incredibly simple to whip together and looks very cute and impressive. But don't think they are only good for breakfast. No, they are very befitting for healthy snacks, as well. 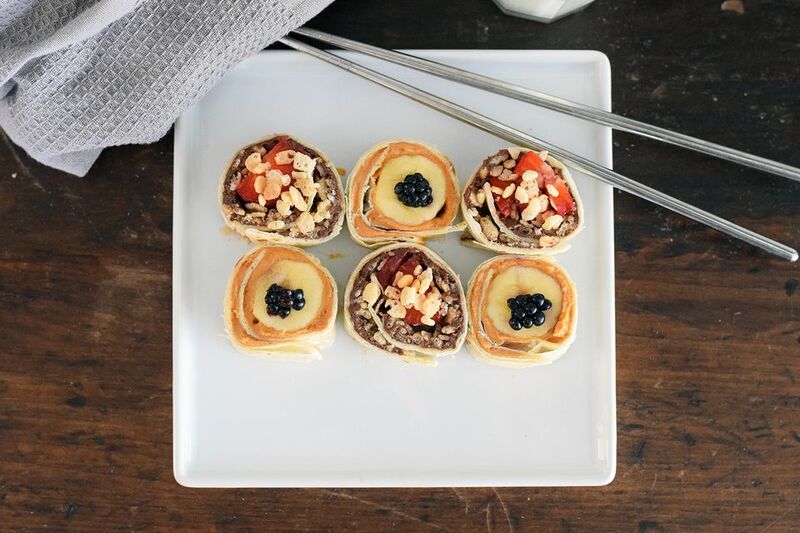 The peanut butter and Nutella make these sushi rolls super filling, while the fruit provides a nice freshness, that's not too sweet. Plus, they can easily be made the night before, sliced up in the morning, and wrapped up in a lunch box for the kiddos (or yourself). If you're like us and enjoy sweet, savory, and satisfying recipes, this sushi is ideal for you. We've included two versions of this breakfast treat, but feel free to get creative yourself. You can switch up the nut spreads, the fruit, or try adding different cereals. Want to make things even more fun? Serve them with chopsticks and a fruit sauce (included below) and enjoy! Lay out the tortilla on a flat surface. Spread the peanut butter evenly over the entire surface of the tortilla. Lay the peeled banana into the center of the tortilla. Roll the edge of the tortilla over the banana and keep rolling until the banana is enclosed. Make sure to roll tightly. If you are making these ahead of time, wrap it tightly in plastic wrap and place in the refrigerator. Once you are ready to serve, use a very sharp knife to slice the roll into 1-inch circles. You should be able to slice about 6 to 7. Lay them flat on a plate and top each one with a quarter of a blackberry. Enjoy! Lay out the tortilla on a flat surface. Spread the Nutella evenly over the entire surface of the tortilla. Sprinkle the Rice Krispies over the entire surface of the tortilla. Lay the quartered strawberries into the center of the tortilla. Roll the edge of the tortilla over the strawberries and keep rolling until the fruit is enclosed. Again, make sure to roll tightly. If you are making these ahead of time, wrap it tightly in plastic wrap and place in the refrigerator. Lay them on a plate and serve. Use chopsticks for fun! Heat the strawberry jam and water together in the microwave for 1 minute, or in a small sauce pan until just simmering. Serve alongside the sushi for dipping.